Even GREATER than "Seventh Veil"
Eliot Foley: Ah! Walter Craig? Walter Craig: How do you do? You're Eliot Foley. Eliot Foley: That's right. So glad you were able to come, let's have your bag. Eliot Foley: We'll put the car away afterwards. You know it struck me after I'd telephoned you, rather a cheek on my part asking a busy architect like yourself to come down and spend the weekend with a set of complete strangers. Walter Craig: Not a bit. Eliot Foley: You see we're pretty cramped for space here, we need at least two more bedrooms. Walter Craig: And with only one living room. Q: How many stories are in this anthology film? And I thought I might have dreamed up the whole thing! For years I've wondered if I really saw a movie that served as the source for innumerable childhood dreams and fears. I tried telling folks about seeing this British film on TV in the 1960s, but it was so jumbled in my memory that I really couldn't describe it properly. I knew it led to a lifelong dread of ventriloquist dummies, but I couldn't figure out how that tied to an architect at a country house party. 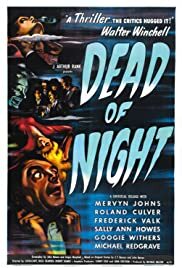 For no apparent reason today I put "ventriloquist movie" into yahoo and skimmed down to Dead of Night - British 1945. At long last I knew that I hadn't imagined the whole thing - and boy am I relieved! I'm also delighted to find that I've been "haunted" by a classic of the genre that has had a big impact on so many others. I'm looking forward to ordering it and watching it again.